At the Netherlands American Cemetery and Memorial in Margraten, there has been a musical tribute every year since 2006; a classical concert that befits the unique location. This in commemoration of the fallen soldiers who gave their lives in the Second World War for the liberation of the Netherlands, and to celebrate the liberation of the Netherlands in September 1944, which started in the south of Limburg. The next concert will take place on 15 September 2019. The concert will be performed by philharmonie zuidnederland. BY CAR Coming from the A79 or Maastricht. A79 take exit Cadier and Keer / Vaals. Follow N278 through Cadier and Keer towards Margraten / Vaals. Continue to follow N278 until you reach the American Cemetery. There is ample parking space at the cemetery. Coming from the A76 or Parkstad. A76 take exit 7 (Vaals / Simpelveld). Follow the N281 in the direction of Vaals until the N278. N278 direction Maastricht through Nijswiller and Gulpen to Margraten. 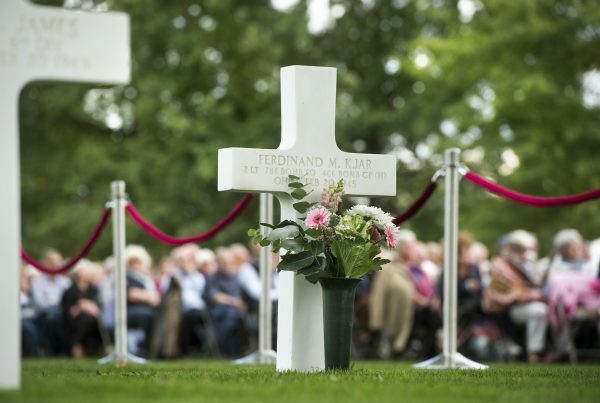 Follow Rijksweg direction Cadier and Keer / Maastricht until you reach the American Cemetery. BY BICYCLE The American Cemetery is easily accessible by bicycle. You can take the bike path along the N278 Maastricht-Vaals. Bike stands are available at the cemetery. Anyone can attend the concert, admittance is free. There are ca 3,500 seats (reservation is not possible). If you would like to be sure of a seat, consider becoming a donor. Please be in time, because of the special character of this year’s concert it can be very busy. There are special places available for the handicapped and one companion. The concert takes place at the American Cemetery and several special rules apply here: visitors should behave in a respectful and quiet manner and respect the crosses. We advise you to dress modestly, even in hot weather (no shorts or sleeveless t-shirts). Making of audio- and video recordings of the concert -other than accredited press- is not allowed. Dogs are not allowed.